We head out early from Smyrlabjorg on our way to Myvatn. It’s pouring, like usual, and my shoes are drenched from my run.But as we head Northeast, if you look very carefully, there may be an odd patch of blue sky. We’re heading towards the Northeast but Route 1 first takes us along the eastern coast. It’s gorgeous, as we head between the sea and the mountains. and of course there are waterfalls everywhere. Iceland must have the most waterfalls per capita of any country, and that’s not just because there are so few people. We detour a couple of times, get on some poor, lonely stretches of road, and the drive takes forever. 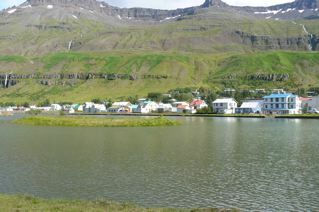 Eventually we get to Seydisfjordur, a tiny, picture perfect postcard town. A local group is filming Alice in Wonderland; the town, nestled between fjords and mountains feels like wonderland. 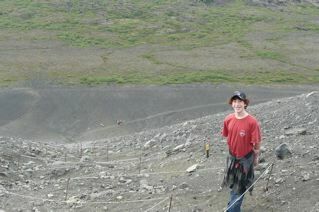 We stock up on Skyr products and make tracks for Myvatn. The road and weather improve dramatically, and the landscape becomes more otherworldly. 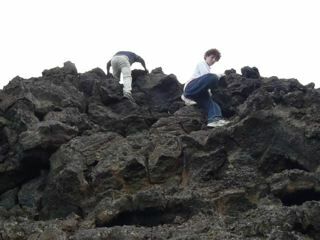 We stop a few times for necessary scampering, climbing and exploring. 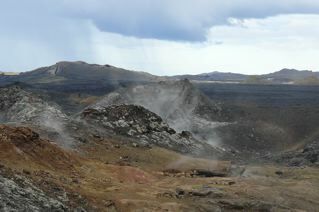 As we get close to Myvatn, we see the steam rising from the thermal Hverir area. At last we see the tourists – loads of tour busses parked in the lot. We go to our guesthouse, Dimmuborgir, where we’ll be in a very pleasant cottage. We go to the actual Dimmuborgir site, an adventurer’s paradise. If you have a kid (or grownup) who likes climbing around, this is the place. The rocks form all kinds of climbing hills, a bit like a natural playground, beating a factory made one anyday. Our son loves it, he’s all over the place and even the weather’s great. We can’t find the marked attractions but it doesn’t matter. we all have a fine time. From there we go to Jarobodin natural baths. It’s not as swanky as the Blue Lagoon, but we love it especially as our mood is so good. We stay late before calling it a day. After breakfast (good, but maybe not as good as we’ve come to expect) we head into Reykjahlid ‘town’ (don’t go to Iceland actually expecting towns. This one is a gas station, supermarket, souvenir shop and a few hotels) to the tourist information. We have perhaps our only unfortunate incident of the trip. The Myvatn map, sold to us t our guesthouse is not only free here, but is distributed free to the hotels and guesthouses to be given to tourists. It’s a small expense but leaves a sour taste. Then we’re off for the day. 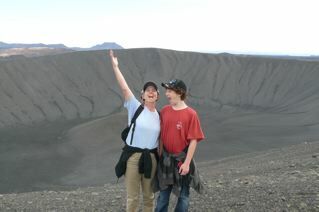 We start by climbing up the Hverfjall crater. It’s a good walk with a great view on a beautiful day. From there we climb down – quite hard – on the rough path, and walk towards Dimmuborgir, again. We do more climbing around and then drive around the lake. It’s very pretty and we stop at Skutustadir (a gas station, restaurant and a couple of hotels) to walk around the pseudocraters. they’re actually not that exciting so we head on. 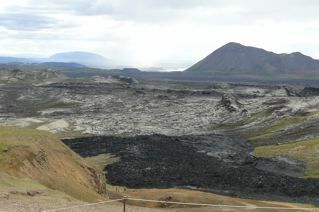 We go to the Krafla area.It’s an enormous volcanic area which has apparently been more or less active for the last 3,000 years. It seems endless and you can traipse around forever which we do. There’s steam coming out of the ground all over but this being Iceland you can get as close up to anything you like. It’s great fun, made better by the fact that our 13-year-old is engaging us in all sorts of discussions, like his future plans. Really wonderful family time. At some point we’ve had enough. We pick up a pizza at Vogar, and then go back to Dimmuborgir. 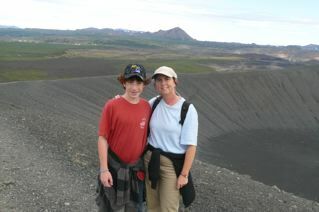 Later our son votes it as one of his top attractions of Iceland. No surprise that, we’ve just been there 3 times in 24 hours.